Jesus is crammed with his disciples into a tiny fishing boat on the Sea of Galilee. They travel from calm, well-lit Capernaum at upper right to darkened Gerasene country on the left. 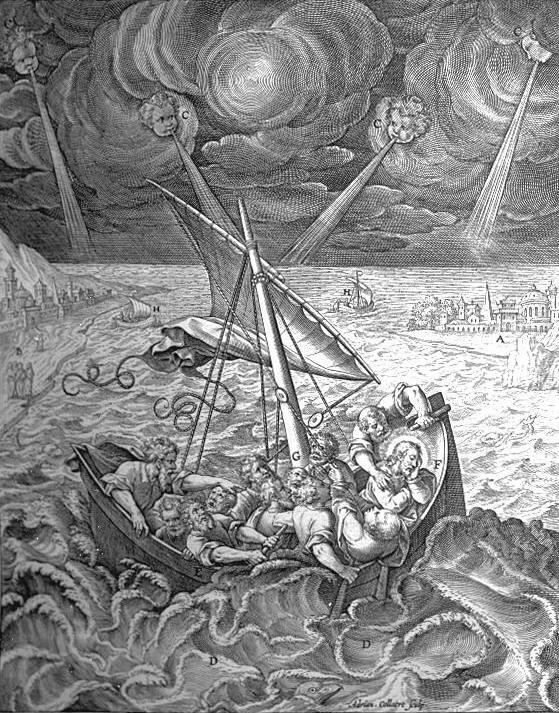 A storm arises – described briefly in the 8th chapters of Luke and Matthew and in Mark 4:35-41. That storm and its embedded psychological drama hasve inspired artists from Rembrandt to Delacroix. The disciples have lost all control over their craft – the sheets of its sail topsy-turvy – and waves are flooding the boat. The men panic and exclaim “We perish!” Their faces are portraits of fear and bewilderment. And what of Jesus, their leader, in whom they had trusted? This ever-reliable teacher has fallen asleep! We know the rest of the story; we can read on. Jesus will awake, rebuke the wind, and it will subside. He and his friends will go on to confront and conquer a storm of a different kind: demon-possession in the tombs of the Gerasenes. But at this moment, in the midst of the storm, these men do not know that resolution to the story. They know they love their friend; they do not know how to trust in his power. Might each storm and each incident of apparent indifference (human and divine) serve a purpose? Might that purpose be to shape and to provoke the faith of each of those, each of us, caught, helpless, in the moment – offering every person in the boat and on the shore a new reason to ask again the Big Question: who is this Jesus? The expressionistic engraving above was created to spark just that question. It is a detail of one of the 153 prints published in 1593 in a book called Evangelicae Historiae Imagines (Images of The Gospel Story) in fulfillment of a long-held goal of Ignatius of Loyola (1491-1556). The entire page is shown below. Using perspective and realism to invoke a dynamic sense of gospel narrative – so that all people regardless of their age or education might make sense of the gospel – this Jesuit guide to the life of Christ was one of the most powerful evangelistic systems ever developed. It contributed meaningfully to the revitalization of the Catholic faith across Europe and to its penetration around the world, conveying the good news to people from Africa to China to Peru and beyond. 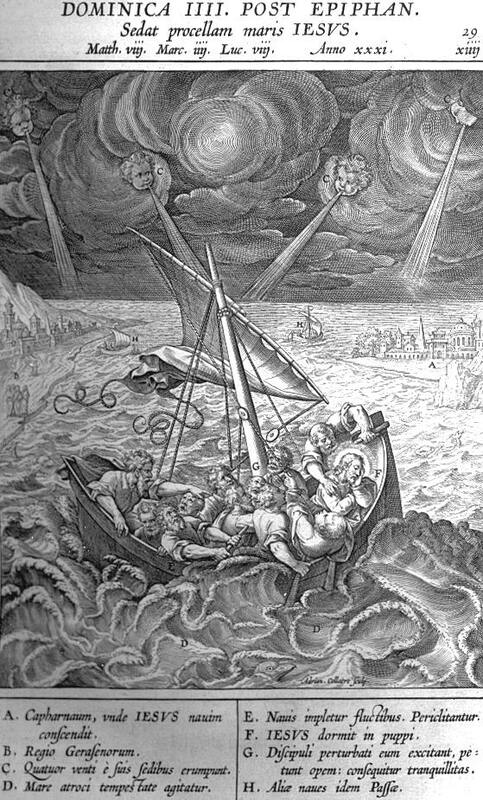 Jesus Calms a Storm at Sea, engraving from the book Evangelicae Historiae Imagines, commissioned and annotated by Jerome Nadal and published in Antwerp in 1593. Jerome Nadal (1507-1580), a Spaniard from Majorca, was one of the first ten members of the Society of Jesus (a.k.a. the Jesuits). For many years he served as the personal representative of the founder, St. Ignatius of Loyola (1491-1556), visiting Jesuit houses throughout Europe to convey a consistent and comprehensive understanding of the purposes of the order. Ignatius urged Nadal to compile and distribute an illustrated guide for prayerful meditation on the Gospels in the tradition of Ignatius’s own Spiritual Exercises, although the work was not completed until after both men had died. Nadal selected 153 biblical scenes, integrating the three synoptic Gospels and the Gospel of John into a single narrative composed of annotated illustrations depicting the life and ministry of Jesus in chronological order. He further commissioned and directed the layout of each engraving and composed brief and simple Latin notes describing features of each scene. See, for example, the letter “A” which designates Capernaum on the engraving above, and the letter “C” next to the head of each of the four full-lunged putti. He aimed for all viewers to have a clear understanding of each scene regardless of their own native tongues or geographic settings. Nadal believed that because of Renaissance advances in science and printmaking technology, the sacred idea of his images would now appeal with greater realism and clarity to a larger audience than any religious art before, by means of the most universal of all languages, that of pictures, enhanced now by the easy-to-read conventions of the modern machine diagram. Nadal's book influenced the manner by which Christian missionaries went about converting people of other faiths, and of no faiths at all. The Jesuit mission to China under Father Matteo Ricci (1552-1610) carried along Nadal's images as a treasured field manual, an indispensable aid for evangelism. Ricci praised it thus: "This book is of even greater use than the Bible in the sense that while we are in the middle of talking [to potential converts] we can also place right in front of their eyes things that with words alone we would not be able to make clear." Four artists created the engravings (Bernardino Passeri, Marten de Vos and Jerome and Anton Wierix) with the cooperation and support of Antwerp publishers Christophe Plantin and Martinus Nutius. In 1594 and 1595 the engravings were published again in larger volumes entitled Adnotationes et Meditationes in Evangelia (Notes and Meditations on the Gospels), with more extensive accompanying text and rearranged according to the order of readings used in the liturgical year, as prescribed in the Roman Missal. These compelling images guided the spiritual formation of thousands of Jesuit clergymen, and through them the development of countless more laymen and laywomen, who not only heard in word but saw in image the evidence of this Savior come for each of us – now, then, always and everywhere. For more, see http://catholic-resources.org/Art/Nadal.htm.